The grey days of January have settled in, and I’m just about ready to wrap myself up in flannel, hunker down and coast my way through the rest of the month. I’m in no mood for fancy; I want goose down, cuddly sweaters and angora socks. On that same note, there are foods that fit this mood. Without fanfare, they routinely deliver. Simple and to the point, these wallflowers of the recipe file are perennial favourites, but not always the life of the party. Such is the case with these muffins. Reasonably healthy and utterly flavourful, they offer up a great sense of accomplishment after only a modest amount of effort. Truly, if you can produce warm baked goods in less than 10 minutes of prep time, do you not feel rather smart? I say, all the more time to spend cozied up with that goose down. While some plans may prevent me from participating, I encourage everyone to check out Sugar Low Friday, hosted by the ever-fab Sam of Becks & Posh. The one-time event will be held on January 27, 2006, details to be found through the link. Preheat oven to 375ºF (190ºC). Lightly grease a 12 cup muffin tin, or line with cupcake liners. In a large bowl, sift together flour, baking powder and salt. In another bowl, whisk together egg, honey or sugar, egg, milk and bananas. Stir in cereal. Add wet ingredients to dry and stir until just blended. Stir in cranberries. Divide evenly among prepared muffin cups. 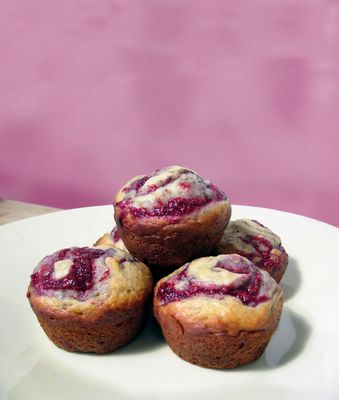 Bake for 20 minutes, until a tester inserted in the centre of a muffin comes out clean. Leave muffins in tin to cool for 2-3 minutes, then remove to a rack to cool completely (or serve hot). • These muffins do not rise a lot while baking, and so are more like little flat-topped cakes. If you prefer a larger, domed muffin, I would recommend dividing the batter between 6-8 muffins instead. Be sure to space them evenly in the tin and adjust the cooking time accordingly. • A raisin bran cereal could also be substituted, as could fresh or frozen berries. Frozen berries will colour the batter a bit, due to their juice. • Depending on your bananas, you may find you need to hold back a bit of the milk. I usually use between 3/4 cup and 1 cup. I will be continuing my cookbook exploration, as promised. Stay tuned. I am, as you may have suspected, one of the many food-obsessed. While eating breakfast, I’ll be planning my lunch and preparing a mental shopping list for dinner. When we go out, I’m constanly looking in market stalls, restaurant menus and other people’s grocery carts for inspiration. When enjoying a meal, I’m critquing the bite in my mouth, keeping an eye on the presentation, and rarely does my date survive without at least one bite stolen from his plate. When faced with a dish, I automatically compare it to the times I have had it before, considering what I like and would improve in this incarnation, and looking for ways in which I can create my own version. It’s a compulsion, and I relish every minute of it. I realize that the food-obsessed is not a rare breed, but we are a passionate, inquisitive and enthusiastic bunch. Not a terrible combination, I’d say. Most recently, I became fixated on peaches. The hot hazy days of late July were upon us and, in my opinion, there is nothing more equatable to summer than the honeyed sweetness of a ripe peach. One bite into the yeilding flesh, with juices flowing down your chin, and you’re tasting all of the season. Living in a prime stone and soft fruit region, my anticipation grew, and I began culling recipe books and websites for peach recipes, finally stumbling upon a streusel cake from Williams and Sonoma. But oh, one recipe would be too simple. 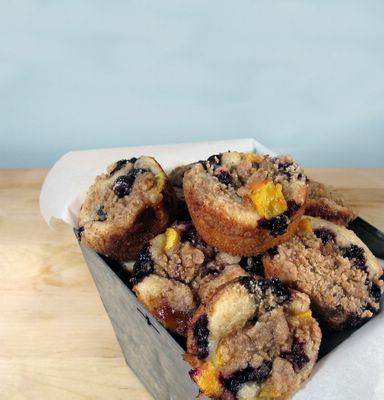 Still on my mission for the perfect recipe, I clicked over to the charming Delicious Delicious and was interested in Caryn’s blueberry streusel muffins. What if I took the W&S peach recipe and converted it to muffins or mini-cakes instead? I have no idea where the sour cream came in. I swear, I was all set on my recipe, and out of nowhere came the thought of the tangy density of a good sour cream crumb cake entered my busy little brain. And so, I was lost. The third recipe hunt began. Donna Hay’s Modern Classics: Book 2 proved my saviour, with her sublimely simple muffin base recipe (my usual standby). So I was set. I would combine the struesel from Williams Sonoma, the form from Caryn, the base from Donna Hay (slightly altered) and I would have my peach perfection. Then my dear father offered me a pint of gorgeously bursting blueberries. Remembering the colour combination of black and peach from Nigella’s fruit bake with yoghurt (blackberries and peaches), I couldn’t resist his offer. This was collaboration at its best, and the result could not have been more rewarding. With thanks to the many contributors. Preheat oven to 350°F (175°C). Butter and flour a 9 inch round springform pan (see Note). To prepare the streusel, stir together the flour, brown and granulated sugars and cinnamon in a bowl. Using a pastry blender, two knives or your fingers, cut or rub the butter until coarse crumbs form. Set aside – if working in a warm kitchen, refrigerate until needed. For the cake, sift together flour, baking powder and salt in a bowl. Stir in sugar. In a separate bowl, whisk together sour cream, eggs, vanilla and oil, until smooth. Stir the sour cream/egg mixture through the dry ingredients. Be careful not to overwork the batter – mix until just combined. In a small bowl, combine the blueberries and peaches. Pour batter into prepared springform pan and spread evenly to fill the base (the batter will look like it is too little, but it will expand while baking). Sprinkle the mixed fruit over the batter and evenly top with the streusel. Bake until lightly golden brown and a cake tester or toothpick inserted in the centre comes out clean, about 35 minutes. Transfer the pan to a wire rack to cool for 20 minutes. Remove the sides of the springform pan. Can be served warm or at room temperature. 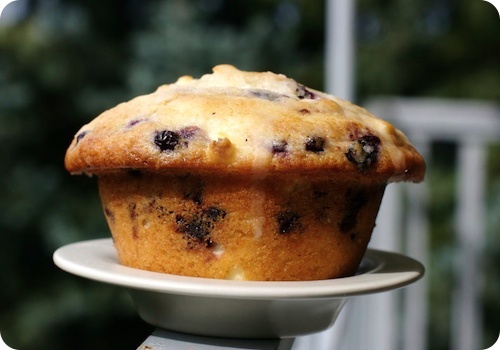 • As pictured, this recipe can also be made in a 12 x 1/2 cup capacity non-stick muffin pan. When spooning in the batter, fill until about two-thirds full. Reduce the cooking time to approximately 12 minutes. In this preparation, you will have extra streusel topping, which can be frozen for a later use. • To peel peaches, simply bring a two-thirds filled saucepan of water to boil. Using a small knife, cut a small, shallow “X” into the bloom end of each peach and immerse the peach into the boiling water for 30 seconds. Lift out with a slotted spoon and transfer to an ice bath until cool (you can skip this step and allow them to cool on a board, but I find the ice bath expedites the process). Once cooled, the skins should peel off easily, using either your fingers or the knife. I have a bit of a confession to make – I compulsively freeze things. I’ve become a freezer pack rat. It began last winter. When faced with cold, dark nights after work, I wanted comfort and ease. So I began planning ahead, doubling recipes for hearty casseroles and stews, tucking away my bounty into neatly packed containers and promptly sending them into the deep freeze. I felt terribly domestic, organized and prepared. Whenever I opened the freezer, greeted by my handiwork, I felt accomplished. But then, it started taking over. Somehow the ease of being able to tuck away food for a later day spawned a neurotic compulsion in me. Now I not only freeze pre-made meals, but I’ve begun freezing leftovers. Not exactly leftovers, but the odds and ends we sometimes find ourselves in possession of, through the course of a recipe. Think egg yolks (whisked with a bit of water), stock cubes, and compound butters. No matter the mouthful or morsel, the tiniest tidbit, I cannot throw things out. Into the freezer they go, packed and labeled, waiting patiently for their culinary rebirth. • Bones from two chickens. From various recipes, for the day I finally make stock. • 1/2 can of tomato paste, frozen in cubes. I couldn’t find it in the tube, and I hate those little cans. • Pan drippings from a roast. I wasn’t making gravy that day, but I couldn’t part with the drippings. • 1/2 cup of sweet garlic marinade. The chicken did not need the drenching I had believed. • 1/2 batch of pumpkin purée. Excess from pumpkin cheesecake last Thanksgiving. • Eight of the aforementioned egg yolks. Leftovers from a birthday pavlova. • Three blacker than black bananas. I always seem to buy too many, these are destined for banana bread. • 1 1/2 cups of raspberry purée. For a birthday cheesecake, I went a little blender happy. I used it for the cake, and for Bellinis, but still had excess. The raspberry purée has been invading my thoughts. I’ve been planning a Mother’s Day brunch, and wanted to see if I could somehow incorporate it into my menu. Its colour was calling me — somewhere between rubies and fuchsia, the purée seemed perfect for the festive occasion. Feeling excited over the prospect of conjuring something from the depths of my freezer, I surveyed the purée’s bunkmates. Spying those ripe bananas brought about my solution — muffins. 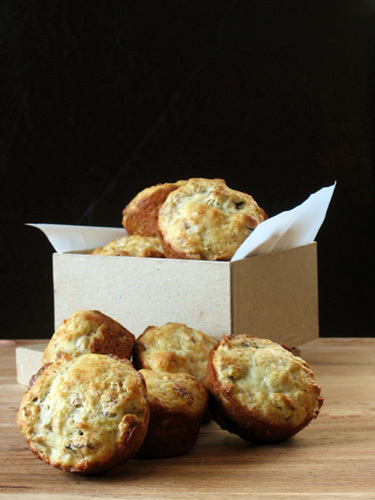 Absolutely a breeze to make, these muffins are the perfect start to a day or a midmorning snack. The intense, almost caramel sweetness of the banana base is cut by tart, jeweled jammy-ness of the berries. Truth be told, my muffins were a bit overdone on the bottom. I wasn’t paying attention and I unnecessarily greased the pan, leading to the toasty brown colour seen above. Though I was tempted to hide my shame, I decided better of it – for today is a day we celebrate those who inspired us, encouraged us, and loved us always, even if we almost burnt the muffins. In a small saucepan over medium-high heat, bring raspberry purée and sugar to a boil. Turn the temperature down and simmer the purée until it has reduced by half. Allow to cool. Sift together flour, baking powder and salt, stir in sugar. In a separate bowl, whisk sour cream, eggs and oil, until smooth. Whisk in mashed bananas. Stir the sour cream/banana mixture through the dry ingredients. Be careful not to overwork the batter – mix until just combined. Spoon mixture into 12 x 1/2 cup capacity non-stick muffin tins until about two-thirds full. Spoon approximately one teaspoon of the reduced purée across the centre of each muffin. With the tip of a sharp knife or a skewer, draw the point through the raspberry, creating a marble effect. Bake about 12 minutes, or until a skewer inserted through the centre comes out clean. • My raspberry purée was simply that – puréed raspberries. It was quite tart, so I added a bit of sugar in the reduction. You may skip this addition if you’d like. • I like to under fill my muffin tins to make miniature versions. If you choose to do so, this recipe will make 18 of the size pictured.